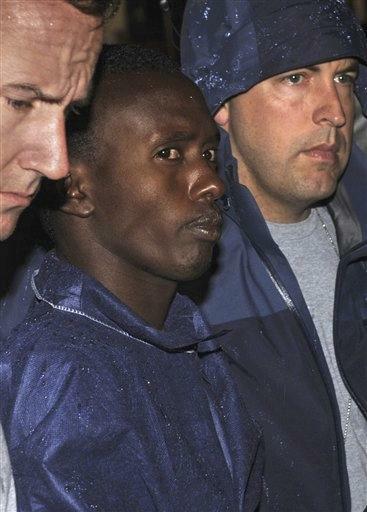 NEW YORK (AP) - A Somali pirate who kidnapped and brutalized the captain of a U.S.-flagged merchant ship off the coast of Africa in 2009 was sentenced to more than 33 years in prison Wednesday by an emotional judge who told him he deserved a stiff punishment for leading a crew of armed bandits who "appeared to relish their most depraved acts." U.S. District Judge Loretta A. Preska choked up as she read at length from letters written by Capt. Richard Phillips and traumatized sailors who were aboard the cargo vessel commandeered by Abdiwali Abdiqadir Muse. The recent spate of piracy on the Indian Ocean and elsewhere "is not a Disneyland-esque problem," she quoted Phillips, of Underhill, Vt., as saying. "These are not Johnny Depps. They threaten seamen's lives, repeatedly. ... They deprive us of the rights that they themselves complain about." Another officer from the ship, Colin Wright, appeared in person to urge the judge to impose a lengthy term. He recalled being shot at and held at gunpoint by Muse and three other pirates. "What happened to us was terrible," said Wright, 44, of Galveston, Texas. "I'm not the same person I was and I never will be." Muse pleaded guilty last year to hijacking, kidnapping and hostage-taking charges. Before he was sentenced, he apologized to the victims, claiming he was a desperate, small-time player in a Somali piracy syndicate that has collected millions of dollars in ransoms. "I'm very sorry for what I did," he said through an interpreter. "I got my hands into something that was more powerful than me." Preska imposed the maximum prison sentence of 33 years, nine months. She noted that prosecutors had described the pirates as experienced, coordinated and sadistic - even playing Russian roulette with their hostages - during the five-day siege of the Maersk Alabama. "They appeared to relish even their most depraved acts of physical and psychological violence," she said. Muse, wearing a green crew-neck shirt and khaki pants, stared straight ahead and showed no emotion as the sentence was announced. The federal prosecution in Manhattan was part of a stepped-up effort to stem a wave of 21st century piracy by seeking justice in U.S. courts, at times using 19th century maritime laws. Late last year, a Virginia jury found five other Somali men guilty of exchanging gunfire with a U.S. Navy ship off the coast of Africa. Scholars called it the first piracy case to go to trial since the Civil War, when a New York jury deadlocked on charges against 13 Southern privateers. Aside from the novelty of his case, Muse became a curiosity because he defied swashbuckler stereotypes: The boyish, 5-foot-2 defendant has often looked bewildered in court and sometimes wept. Following his capture, his lawyers insisted he was 15 and should be tried as a juvenile; prosecutors convinced a judge he was at least 18. The Maersk Alabama was boarded by the pirates as it transported humanitarian supplies about 280 miles off the coast of Somalia, an impoverished East African nation of about 10 million people. Muse was the first to board the 500-foot ship, firing his AK-47 assault rifle at the captain, prosecutors said. He ordered Phillips to halt the vessel and then held him hostage on a sweltering, enclosed lifeboat that was soon shadowed by three U.S. warships and a helicopter. The pirate beat and taunted Phillips by holding a gun to his head, pulling the trigger and laughing when it didn't go off, court papers said. He also threatened to "bury him in a shallow area of the ocean" and by telling his captive he "liked having hijacked an American ship and wanted to kill Americans," the papers added. The siege ended when Navy sharpshooters on the USS Bainbridge picked off the three pirates in a stunning nighttime operation, leaving Phillips untouched. Somalis captured by international naval forces have been brought to several countries in Europe and Asia to face piracy charges. Criminal cases for piracy are under way in Germany, the Netherlands, India, South Korea and Malaysia. Wright, the Maersk Alabama officer, said Wednesday that cargo ships need to adopt more serious safety measures. "We had pocket knives and knives and fire hoses to combat pirates," he said. He also repeated claims by the crew that Phillips ignored many warnings to keep the ship 600 miles off the Somali coast, saying, "The captain for his reasons put us in a very bad situation." Phillips has called such accusations "spurious."